J’onn is a lot like his big brother, Adrian. Adrian has never had an easy time communicating. But as an older, wiser parent, I have been able to help J’onn learn at a young age to communicate better than I did with Adrian. For example, yesterday J’onn was mad we would not let him and Cory play video games. His response is to draw a picture. 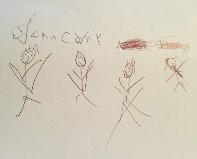 This picture had 4 people drawn with their names written above them, Cory, J’onn, Mom and Dad. The names Mom and Dad were scribbled out. He then delivered the picture to me and I know that is a cue that he needs to talk. So I listened to him stutter out why he was angry, and then informed him while it was a good picture and I was glad we talked, he still was not playing video games. Tonight we read a book, The Tale of the Three Trees, at J’onn’s request. Whenever I finish reading him a book, he likes to “read” it back to me in his own words. On this occasion, whenever he couldn’t think of the word he wanted for the story he was telling, he replaced it- very naturally-with the word “thig.” Yup, thig. The first time he said it, Clara and I just looked wide-eyed at each other, stifling a laugh. I told him I thought he meant “weak.” He agreed, corrected, and kept going. When he said it the next time, I stopped him and he put his hand on his forehead, “Oh yeah, oops!” And he hit his head a few times to encourage the right word to come to the front of his brain. We made it through the story with a few more “thigs”, and then he went to bed. That’s when I remembered a story Clara told me. Clara’s friend, Hannah (born same day, same hospital as Clara), reminded her while studying for the AWANAS Bible Trivia Challenge (in which of about 100 local kids, Hannah took first place & Clara took second!) about what a boy in their Sunday School class had said a few years back. They were going over the 10 Commandments and for number 7, the boy said “Do not commit the elderly.” I thought that was pretty funny. 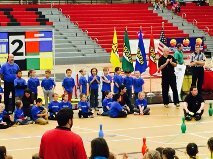 Speaking of AWANAS, Saturday was the AWANAS Games at Whitworth University (my alma mater). Clara, Presley & J’onn played for Team Trinity (Trinity Baptist Church), that hadn’t actually participated for several years. Clara’s TNT Team came in second, and Presley & J’onn’s Sparky team came in first. It was so much fun to watch! I hadn’t been to an AWANAS games since I watched Hailey & Adrian with my mother-in-law 13 years ago! It was great, Go Blue! I know, it’s so small that it’s like playing Where’s Waldo. But I promise, Clara is in the top picture (arms folded- she was very intense), and Presley & J’onn are in the bottom one (J’onn standing on right end, Press standing about 5 kids over looking right)!